This is a really delicious recipe of Philip Johnson’s. It is also the one on which I came to grief one night when the mixture ‘split’ just as I was about to add the egg whites. The flour I should have been using was baker’s flour, or strong flour, which has a higher gluten (protein) content than the plain flour available on supermarket shelves. It is also the flour that many professional cooks use as a matter of course, so that when they say ‘plain flour’, they really mean baker’s flour. Preheat oven to 220C, on static, not fan-forced setting. Brush six 180ml capacity ceramic soufflé dishes with the melted butter and coat with polenta, shaking out the excess. Melt the 50g butter in a heavy-based pan over moderate heat, then stir in flour. Cook and stir until mixture begins to leave the sides of the pan, then remove from heat. Gradually whisk in cream, then milk until smooth. Bring mixture to the boil, stirring constantly. Cook for a further 5 minutes stirring occasionally. Remove from heat and season with thyme, nutmeg, salt and black pepper to taste. Whisk egg whites with a pinch of cream of tartar, unless you are using a copper bowl, in which case, omit the cream of tartar. Whites should be able to hold a peak without sagging. Using a metal spoon, fold one cup of the whites into soufflé mixture to loosen it, then fold in the remainder. 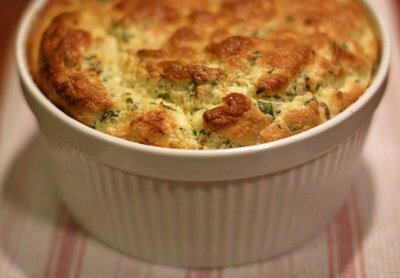 Divide mixture among soufflé dishes and scatter the tops with hazelnuts. Place dishes on an oven tray and bake until souffles are well risen and golden, about 15 – 20 minutes. Serve immediately with a green salad. The pear and walnut salad included with the Goat’s Cheese Tart recipe in this section would be perfect. What an awesome and interesting recipe. I’ve never seen this combination before, but it sounds incredible.